SOCP® (Special Operations Combatives Program®) is a realism based, task-specific system designed to bridge the gap between foundation training and the unique needs of the modern day Special Operations Units. On 23 March, 2010 CG of USAJFKSWCS Major General Csrnko made “SOCP®”, and it’s establishment as the ARSOF Combatives program of record for CA/PO/SF with D Company/2nd BN/1st SWTG(A) directed to serve as the institutional/force SOCP® proponent. 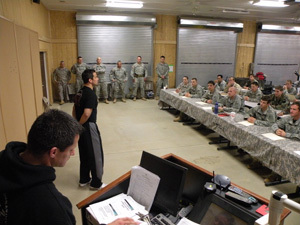 SOCP® is the designated combatives program for all U.S. Army Special Operations Forces. ERB Codes: (SOCP® I: BRT), (SOCP® II: FBR) SOCP® is now the standard program for fighting in kit. SOCP® is currently being implemented at Special Forces Units 1st, 3rd, 5th,7th,10th, SWCS, Special Forces advanced skills battalion, 75 Ranger Regiment, Marine RECON, MARSOC, Air force SERE, Para rescue and is spreading fast to other Special Units, FBI, ATF, Border Patrol and other Federal and State Law Enforcement as well as Special Contract Unit. What techniques are demonstrated in a SOCP® Course? What are the advantages to this system? 2009 MACP adopted SOCP®’s Post-Frame-Hook and 7:00 Technics standing and on the ground witch they call contact rear.